So, is the current meta to stack Shield boosters? I think this is getting addressed in the next patch to create a point of diminishing returns, but would it still be worth it to stack a couple? Also, for combat in a Python, does hull reinforcement stack? Now that you can store parts (and transfer them, AWESOME!!) I see less of a need to maintain a balanced loadout, and since massacre missions pay so much, I want to optimize for combat. I can always swap out to get balanced again later. Makes me wish they had something like the outfitter mod for WoW, where you could setup equipment to certain named configurations. I decided to buy a joystick in the sales and give Elite another try after the best part of a year away. The biggest change in that time would seem to be engineers, so would anyone give me some tips on which engineer to start with and perhaps a teeny weeny walk through on what I do once I get there (for example I have never used the SRV). I think the diminishing returns for the next patch starts at 4 boosters, so the Python's completely safe if you're running a KWS or chaff. HRPs do stack as well. To be honest, if you're going to focus on combat, a Fer-de-Lance is the better investment, as it's currently THE heavy fighting craft. Not sure what the popular meta is, but I still heavily favor them. Other than a heat sink launcher, I load them onto the other seven slots on my big ships. On small ships other defensive options (chaff, particularly) could be more effective since they have a smaller base pool to boost, but particularly with engineering bonuses they're hard to beat right now. Yeah, a diminishing return point around 80% boost is being beta tested. That means past four resistance modded boosters or two heavy duty ones (or some combo thereof) they will provide significantly less effect. I was still running six on big ships when testing, but I could easily see myself dropping another one (or maybe even two) depending on the combat scenario. It's still unclear if it will go live, though. I personally think it's a great change; small and medium ships will barely be affected, and large ships still feel plenty tough while finally getting to feel like there are interesting choices to be made with utility slots. However, lots of whiney complaints on the forums (waaah, my ship is slightly less invincible now!) plus signaling from the beginning that they were unsure of the change means it could get rolled back easily. I suspect we'll know for sure sometime later this week or early next week, though. For now, though, as mentioned a page or two ago, I save out my loadouts using EDMC to generate links to Coriolis/ED Shipyard that include data on my engineered parts, and refer to them later when reconstructing a particular build. Also, for similar reasons I just bought a second Anaconda to stay in my highly specialized long range outfitting permanently, rather than wasting storage slots holding a ton of extra parts. I might start doing similar things with other ships too, although that was my biggest offender. Quickly though, I would suggest starting with Farseer, so you can get your FSD up to snuff. The rest will be SO much more pleasant when you can jump significantly farther. Here's a good Youtube playlist about doing that quickly and efficiently. The one critique I have of his suggestions is that if you already have tons of materials stocked up, grinding out tons and tons of grade 1 mods is probably less efficient than just making three mods at each grade to level up to the next rank. Beyond that, you'll get tons of bang for your buck getting upgraded armor from Selene Jean, and getting thermal resistant shields and resistance modded shield boosters from Lei Cheung and Vatermann. Really though, once you do Farseer you'll get the basic gist of it, and you can use reference material like Inara's data sheets and the very, very useful tool EDEngineer to plan and track your exploits gaining access to and using the engineers. Also worth noting: the next patch will (at least temporarily) be removing the commodity requirements for recipes, since they didn't manage to get commodity storage implemented as fast as they hoped to. Starting out now should be totally fine, as you barely need to worry about the commodities early in the process, but when you get to the mid and late stages, that will make life a LOT more pleasant. I haven't done a ton with the engineers, but the easiest to start with for me was Felicity Farseer, since I was already at Scout and I could easily collect the exploration data to rank up quickly. And upgraded FSDs are nice to start with. The basic idea is that you ask an engineer to improve one of your modules with an experimental effect, and you pay for it with research materials and commodities. Materials don't take up normal cargo space, and can be viewed in your inventory. Commodities do take up cargo space and are getting reworked. There's a list of blueprint requirements here. Some raw material is found through mining (here's where you use the SRV), manufactured material can be found in missions, combat, and USSs. Data materials are collected through scanning, so as you travel around be sure to target and scan various ships, wakes, and so on. At the start, they'll only trust you enough to do tier-1 upgrades, so you'll need to upgrade your reputation with them, either by crafting upgrades or by doing the alternate task that each one has. Each module can only have one upgrade (new upgrades replace any existing upgrade). The exact effect of an upgrade is somewhat random. You get the reputation increase from crafting the upgrade, not from applying it. I've got to grind out another $50 mill or so in 17 Draconis and I'll be able to afford a fully fit Anaconda. Not bad considering I had $11 million to my name three days ago! On a side note while I'm waiting for my shields to regen, I got some additional Philips Hue color ambiance lights for Christmas. My whole office is done in them now, including a light strip under my monitor stand. I have to say, turning all the lights in the room to red to match the guages on the flight panel, and having a red glow come from under my monitor, makes me feel like I'm right in the cockpit! I managed to return my bank account to the high 700 millions on Sunday after my Friday night spending spree nearly emptied it out (less than 300 million, gasp! ), and now I'm trying to exercise some self restraint and take a break until the patch at least, and actually play some other things. (I played and beat Superhot, played a good amount of Hyper Light Drifter, and started Dishonored 2 yesterday!) But, you know, it probably wouldn't hurt to at least log on tonight and check if the war is still on, right? I think I'm done with 17 Draconis, I now have just over 2.5 billion in assets and have run out of podcasts to listen to. This is more money than I could ever spend on any single ship and I'm not the type to maintain a big fleet of fully equipped ships. I tend to mothball anything I don't use, and any ship worth less than 50 million is essentially peanuts to my bank account now. It's time to start working on engineers. Like with asteroid mining the stuff you get from SRV mining depends on the composition of the rocks right? Is there a cheat sheet out there of what minerals can be found where? Yes there are hull tanking builds that maximize stacking resistances and hull reinforcements. They may or may not have a shield as well. This kind of build is better for 1v1 pvp combat because you will have so much HP that you will simply outlast the enemy, assuming both of you are consistently DPSing each other. You also have a lot more power to play with and silent running is more efficient because using it would turn off your shields anyway. In massacre missions and CZs hull tanking is less viable, if your shield pops it's usually because the AI ran out of enemy ships to target and they all focus on you. This tends to lead to instant death, so hull reinforcements are still useful for jumping out. Not sure if it's the 'condas vs. my python, or if you guys are just that much better fliers than I, but you guys are waaaay more efficient than I if you're hitting billions. Congrats! 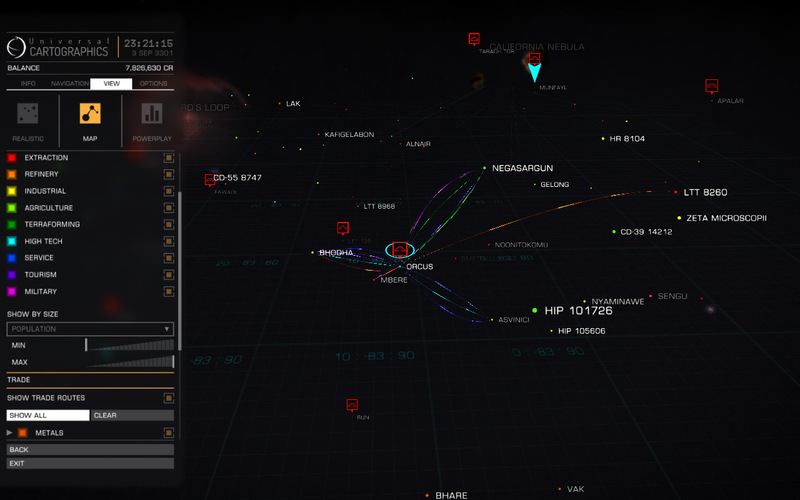 As for the SRV mining, check out the info panel in System Map for each individual planet, it tells you what minerals you'll find on it and in what percent. Arsenic for instance is one of the rarer ones, if you find a planet with 2.0 - 2.5% arsenic, that's pretty good. Drop rates aren't anywhere near as rare as you'd think with those numbers. Also worth noting: patch 2.2 or one of its minor updates introduced a bug to the scanner. It's a known issue and being worked on, but just so you know ahead of time, occasionally you will get "ghost signals" on your scanner. I.e., you'll chase down a signal, and find nothing. You're not crazy, and that's not the intended behavior (my guess is that changes to the terrain generation algorithms didn't get fully integrated in the object placement system, and objects are sometimes being placed underground). It's not game breaking, but it can hurt your spirit a tiny bit when you FINALLY find a signal for a metallic meteorite (the object type with the best chance to contain the rarest and most sought after materials) and run it down only to find it's not there. No clue on relative pilot skill, but I can assure you, you've no reason to feel bad -- the bigger ships are very, very durable and deadly, especially when engineered to the gills as mine are. My two big combat ships, for example, have about 3.5 times the shielding (around 2000 MJ) that my Python does, and roughly 3 times the armor (1500 to 1800 HP) -- all three ships being heavily engineered, of course, so they all have similarly high damage resistances, and all using biweave shields for fast recharge rather than gigantic shield pools. While the big ships might take a tiny bit more time to get on target, not having to stop and recuperate your shields (unless you get REALLY careless) makes a HUGE difference in overall up time. Also, they have much greater firepower. 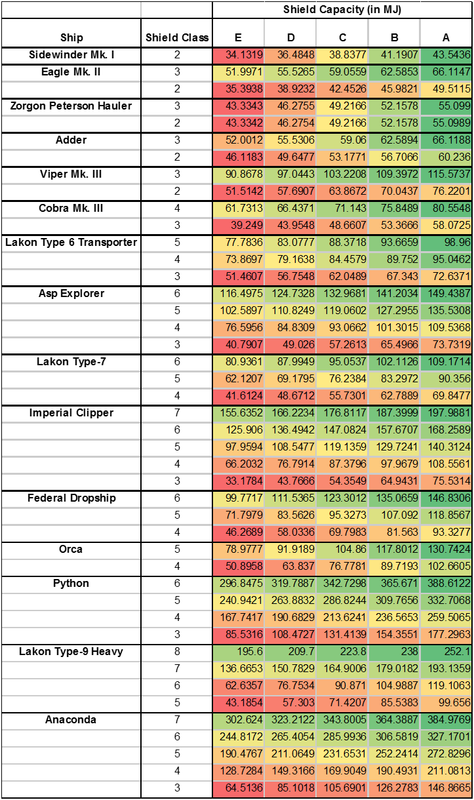 Again, comparing the current outfittings on my ships, the big guys have about 20% to 25% higher DPS potential on their own, and if you add in a well managed fighter that that's another 30% or 35% DPS on top of what the Python puts out. So, things die much, much faster, and I very rarely have to take a break to recharge. I seem to have run out of massacre missions at 17 Draconis. Which is fine, as I'm now at $150m cash. The wars come and go pretty frequently in that system due to the unique combination of background sim properties going on out there. Even if the current conflict has ended, a new one will probably crop up in another few days. It's mostly the Conda vs Python part, the more firepower means quicker kills, especially against bigger ships like corvettes. It used to be the exact opposite where lighter more agile ships just annihilated everything because you could get close and apply damage directly to the target's power core and bypass their HP. You could chain kills together so fast that the instance would just run out of enemies. That's still sort of true, but there has been a significant amount of power creep since then. A single Vulture on it's own with pulse lasers can do good work, but will struggle to get past the shields of bigger ships when they can just spam shield cells to keep them up. And agility offers far less protection when everything seems to carry railguns these days. The whole system seems to be a revolving door where two random factions sink into a civil war and reduce their influence to near zero. This causes civil unrest and lock down and a third faction will take over the system and start the cycle over again. When I first starting doing CZs each federal faction was fighting one of the independents. Then they switched the independents they were fighting. And then in the most recent cycle both feds were fighting each other. I grabbed the T-Flight X. Older model but still well reviewed for a budget HOTAS. It's probably another 2 weeks away and I'm very tempted to jump in now and play around but not sure if I want to relearn the controls again when it arrives. Managed to learn how to drive the SRV. It took a lot of practice and I still spin out uncontrollably if I try to drive over 60% speed. But it may be because I'm practising on low gravity worlds. I find that when the ground is too rough it's better to just leapfrog and avoid touching the ground at all. I'm also pretty bad at planetary landings so I bought a disposable sidewinder to avoid risking my 500 million credit Anaconda. You can see the tire tracks all over the place. What isn't visible is the big scratch on the windshield where I tried to do a backflip over the parked Sidewinder and things went pear shaped because my thrusters disabled themselves after getting too close to the ship. Though I've got weeks worth of Elite flight time logged, ever since the Beta, so you'll get there eventually. Well, the patch may not drop until next week. And, they haven't been terribly specific just how badly they are going to nerf things here -- mostly they've said they are going to close the skimmer exploit, and reevaluate things. I suspect this will remain an excellent place to make money from combat even after the patch, just maybe not quite as spectacular. I've actually found myself playing in open a lot more often, incidentally. It helps that thanks to my obsessively overbuilding my bank account, I'm not even terribly worried about the 16+ million rebuy on my Corvette, but it's actually been quite positive all around anyway. Aside from the usual joy of seeing more ships around stations and having friendly chatter in the comm box, I've acutally had tons of luck with pick up wings in the combat zones. Thankfully everyone seems to be choosing to work for Jet Bridge this time around (probably because they seem to offer slight more missions most refreshes), so it's just been one friendly team up after another. Anyway, might be worth a try for anyone feeling flush enough to risk the rebuy as well. Yeah, somewhere in the last two weeks of massacre orgies I crossed the seven week mark... by two days. At this point I'll make zero apologies for the size of my fleet or my bank account. Also, that stat just above time played remains pretty fun too. Rebalancing the mission rewards across the board while putting caps on the number of mission you can take of a single type would be a patch in and of itself. They will probably do something simple like make it so that skimmers no longer count for massacre missions. I can't either. I worry less about money, I figure find the fun and the money will follow. Though I say that during a period of burnout wherein I don't even wanna touch the game. 17 Draconis is in lockdown, and the CZ has switched from Low Intensity to High Intensity. Worse, it's in a ceasefire. And I've got a half dozen missions with 1 or 2 ships left to kill. How long does a ceasefire last, and do I have any options or am I just out of luck on these last missions? EDIT: Managed to find a single ship in a RES that was both a mission target and wanted, so finished up that handful of missions. Have a full stack of missions I just accepted which are likely to fail if the ceasefire lasts more than 20 hours, but guess there's not much I can do about that. Yeah, it usually takes a day or three for a new war to kick off -- and there's no real guarantee which factions are going to be involved, so while you might get lucky you are probably taking a wash on those. War profiteering isn't all roses and tea parties, I'm afraid. I feel your pain, though -- on my first cycle I got caught with a full stack of 20 incomplete that I figured I'd have time to finish in the morning. You'll definitely take a hit to your reputation with that faction due to the failed missions, but it's not too hard to recover (for instance, you can do a few donation missions, and build up your military rank at the same time). And for the future, the closer you get to the potential end of the war (i.e. 3 to 5 days in) the more it pays to exercise caution about taking on missions you can't complete in one session. Oh yeah, I suppose you could just go bounty hunting until you kill enough targets from that faction. Good thinking! Well the good news is, after the missions I did complete, my bank is up to about 290 million credits. Not enough to buy me an Anaconda with absolutely every bell and whistle, but pretty danged close. And I got smart in my old age, I abandoned the unfinished missions before turning in the completed ones. I'm not 100% Allied anymore, but the turn ins did get me back up to half way through Friendly at least. Yeah, one stack of massacres or a few million in donations any you'll be back all the way up. No big whup. Am now the proud owner of a huge honkin' Anaconda. Still have some modules to find (5D Life Support, 6A Shield, 5A Fuel Scoop), but other than that mostly fitted out. Flying this thing feels like I'm flying a freaking aircraft carrier! Which, I suppose, it is. Speaking of, fighters and crew. Hired a crewman and deployed him at a Nav Beacon for some light bounty hunting. Pretty effective. Not sure I like that he gets a cut of everything, including trade/exploration, but that may be livable. Haven't tried flying one of the fighters myself yet, that's next I suppose. Also, using turrets for the first time (pulse turrets in the small points). Is there any reason they need their entirely own fire group? ZeroKFE, I'm using the weapon setup from your loadout for now. I've got all the lasers in one group (3x size 3 gimballed and 2x size 1 turreted) and all the multi cannons (1x size 4 and 2x size 2, all gimballed). Any reason that won't work? Still have some modules to find (5D Life Support, 6A Shield, 5A Fuel Scoop), but other than that mostly fitted out. Yeah, they're very, very effective -- as long as you order them onto your current target. - As mentioned elsewhere, hire the cheapest grade only. They start out pretty terrible, but level up fast, and you'll get a significant discount vs hiring them already at the higher skill level. - I suggest the Imperial Fighter with fixed beams. Or short of that, anything with fixed weapons. When their skill is low the NPCs might be slightly better with gimbals, but once they level up they will have crazy good on target time, so if you are mostly having the NPCs fly them, no reason not to go fixed. - The Imperial Fighter will explode pretty much as soon as an enemy sneezes in its direction, which might inspire you to use one of the other models that's slightly tougher. In practice, though, I've found their piddly amount of extra shielding/armor to not matter at all -- the fighters are pretty much all super fragile and designed to be disposable. If your cannon will be made of glass either way, might as well make sure it's as good as possible at being a cannon, right? That's how I use them, yes. Set your turret mode (in the last tab of your right panels) to "target only" and basically tap your trigger once to get the turrets going. They will then continue to fire whenever they can, even if you aren't holding the trigger to fire the other weapons on that firing group. Don't expect too much, from them though -- those small hard points are located horribly even for turrets.